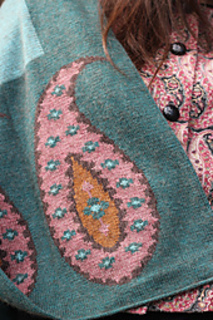 Though it was inspired by a Georgian woven Kashmir shawl, this wrap has a chic contemporary feel. An icord beginning, icord selvedges and icord cast-off (bind-off), creates neat edges all around the wrap. The pattern includes tips for yarn management in the intarsia motifs. Indian Summer is also available in my book, A Time To Knit. See here for details.